Whether at work or at home, a difficult person can make your life miserable. The emotional distress caused by an unpleasant customer, co-worker, or even family member can leave you feeling drained. Sometimes it feels like you’re the only one making an effort. When what you try doesn’t work you may find yourself wanting to escape. What if there was a better way to prevent and resolve conflicts? Imagine knowing exactly what to say so that, rather than becoming offended or defensive, the person becomes more cooperative and your relationship becomes more harmonious. What if in the heat-of-the-moment, you knew precisely how to defuse a volatile situation. Hint: telling others to calm down only makes things worse. Consider how workplace morale and profits would improve if you could consistently convert an upset customer into a fan. Think of the impact on your personal life if you could resolve disagreements with neighbours, friends, and family members without creating hard feelings. Deal effectively with the most difficult person in your life. Lengthen your fuse when it comes to tolerating ‘difficult’ people. Handle know-it-alls, negativists, and complainers. Earn the respect you deserve from people who are aggressive. Persuade others when they aren’t rationale and won’t listen to reason. Express anger appropriately when others are disrespectful. Resolve relationship issues that can drain your spirit and hamstring your effectiveness. 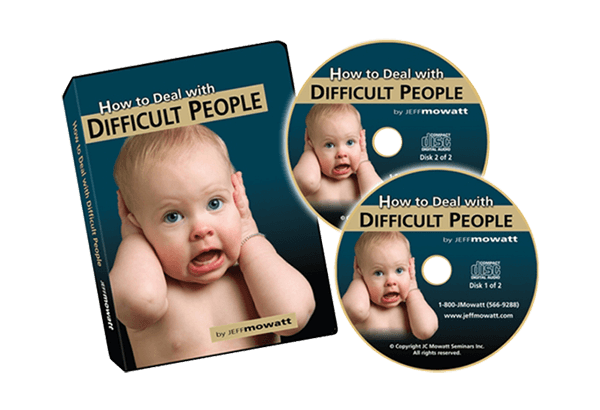 Other approaches to dealing with difficult people tend to focus on relationships in either the workplace or the family. They discuss handling angry customers and problem employees. Or they explore couples and parenting issues. 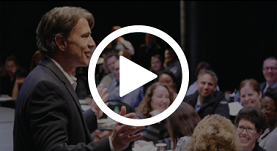 With this kit however, Jeff shares communication tools that build trust with virtually any human being. The techniques you learn here will enhance your relationships at work and at home. Kit Includes 2 audio CDs recorded live and in studio with Jeff Mowatt. Jeff uses real life stories to illustrate the funny and frustrating aspects human interaction. It’s entertaining, engaging, and real — a great environment for learning. 80 minutes. Heavens, we teach customer service, we certainly want you to be happy as our customer! If you’re not completely satisfied with this or any of our other training resources, just return it within 30 days for a full refund. To receive automatic email updates and notices about Jeff’s programs, sign up for his 30 second bi-weekly Influence with Ease tips.